This kind of pendant lamp is made of hemp, not only functions as the lamp but also a decoration which is retro and industrial. What are you waiting for? Just come and buy! 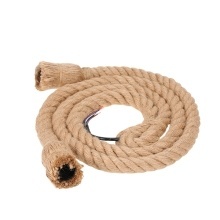 Made of hemp rope, it looks very special and vintage. You can tie various attractive and unique knots as your preference. Perfect to create warm, romantic atmosphere for your restaurants, bars and cafes etc. The bulb and base are not provided.